Those words, written by Starbucks CEO Howard Schultz, have never resonated more than they do right now. Shareholders at Starbucks (SBUX) have filed a resolution asking the company to refrain from election-related spending. That means no giving to super PACs, no checks to party committees and no money for trade associations and nonprofits that spend in politics. Schultz would be wise to consider adopting the policy because it represents a real chance to spark some much-needed positive change in the way Washington, D.C., does business. In 2011, Schultz began researching election spending and was aghast at the ever-escalating price tag to run for office. Frustrated with partisan politics and the debt ceiling fiasco, Schultz called on his fellow CEOs to boycott campaign donations until our nation’s leaders dropped their dysfunction and got to work on the people’s agenda. The response he got was impressive: More than 50 business leaders took up his pledge to forgo giving to politicians. Two years later, the country is still reeling from a record-breaking $7 billion election spending frenzy. Now is the time for Schultz to take the next step with his pledge and enshrine a “no political spending policy” at Starbucks. Shareholders across the country are anxious for reassurance that their money is not going to fund sleazy attack ads, and the American people are ready for a government that actually works for them – not corporations. For investors, the appeal of “no spending” resolutions is obvious. These policies provide the ultimate assurance that shareholder money is not being carelessly tossed into the ring or used to advance the perverse political interests of CEOs and executives. And research suggests that political donations are associated with stunted long-term growth at some firms. These reasons are precisely why shareholder resolutions calling for disclosure, lobby disclosure and refraining from spending have steadily increased every year since the U.S. Supreme Court’s Citizens United v. Federal Election Commission decision. Of course, high-priced elections don’t just have consequences for investors. For lawmakers whose campaigns and careers rise and fall on the whims of funders, big donations can close paths to compromise before they are even considered. Being tethered to donors can limit lawmakers’ ability to ask the hard questions, propose the tough amendments and cast the critical votes often needed to create real change. Our politicians’ inability to find common ground and work for the majority of Americans stems in part from positions hardened by a system that permits unlimited campaign expenditures and makes lawmakers indebted to corporate and wealthy funders who do not reflect the diversity of average Americans. The failed attempt to stop the sequester is just the latest example that dysfunction in the nation’s capital is rampant. What’s more, to raise the funds necessary to be a contender in a competitive campaign takes an incredible amount of time that lawmakers otherwise could be using to review policy and build the relationships that often help foster discussion and compromise. By some counts, members of Congress spend anywhere from 30 to 70 percent of their time fundraising. The Democratic Congressional Campaign Committee’s model schedule for lawmakers calls for four hours a day of calling potential funders. The American people know this game is rigged, and accordingly, there is overwhelming support for getting corporate money out of elections. In a national poll, more than 80 percent of those surveyed agreed that there is way too much corporate money in politics. Agreement with this sentiment cuts across partisan and ideological lines. Going a step further, 70 percent of those surveyed believe a ban on corporate funded ads would improve politics. There is broad agreement that corporate spending makes Congress more corrupt and Washington, D.C., more negative. The saddest part of this state of affairs is that 84 percent of Americans believe that average people’s voices are drowned by corporate political spending. Back to Starbucks. What can one company do to fix a broken democracy? To its credit, Starbucks already has an excellent voluntary political spending disclosure policy, but we need the company to go a step further. The best corporate actors should be willing to say “Enough is enough” and refrain from spending money in elections completely. Even better, we need Schultz and Starbucks to recruit other companies to do the same. 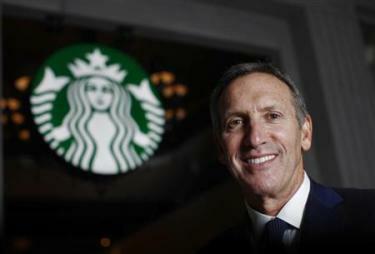 Schultz has said that he sees earning the public’s trust as key to Starbucks success. In a speech last year, he said, “The value of your company is driven by your company’s values.” By Schultz’s own logic, taking a stand against corporate money in elections looks like a big win for Starbucks investors, consumers and democracy. Lisa Gilbert is Director of Public Citizen’s Congress Watch division. Kelly Ngo is a Legislative Assistant with Public Citizen’s Congress Watch division.